"Revised restrictions on the importation of seed potatoes." Bergert et aly ring rot. necessitate the disinfection of the shipments. made clear that the selected tubers were actually grq iuf-or seed! lower the vitality of the tubers. special reason to disqualify thornm for that also. unsuitable for seed or consumption. Article 5- Provision for revision when necessary. Article 6. 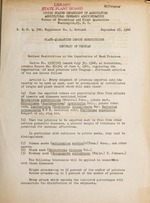 Revocation of decree of June 4, 1941.